Confused about which wheel type is right for your bike? Our riders have put together this informative guide on the benefits of various wheel options. Having the right wheels on your bicycle can make a huge difference to your cycling experience, helping you to gain additional speed and comfort from your bike. Custom road wheels have become increasingly popular over the past few years, enabling riders to choose the exact components they want from their wheel. However, original, factory-built wheels have several key advantages over a custom wheel set-up, and are a better bet in the majority of cases. Perhaps the main advantage of factory wheels over custom examples is their reliability and build quality. Factory wheels are produced using an integrated process, with the spokes and hub matched to the rim of the wheel. This procedure confers both reliability and weight benefits, allowing companies to manufacture a stronger wheel that uses fewer spokes than an equivalent modified product. Custom wheels, on the other hand, are made up of individually selected components that may not necessarily work as well with each other as a factory set-up. Factory wheels also have the benefit of being manufactured by established cycle companies, who generally have well-developed and effective manufacturing processes. By contrast, custom wheels are usually made by much smaller wheel shops, who may not be able to produce products to the same high quality and level of finish. Another key advantage of factory wheels is that, as they are produced in quantity, they can usually be bought off the shelf. This is significant in that it allows the rider to test new wheels before buying, enabling him or her to find the wheel that is right for her particular riding style without risking any money. Custom wheels are always built specifically for an individual rider. Although this gives the rider the opportunity to specify what they want from the wheel, it also raises the possibility that the finished wheel might not perform as well as they had hoped on their particular bike. As most custom wheels are sold on an “as seen” basis, this scenario would leave the rider with either a bill for a replacement wheel or an unsatisfactory product. The “off the shelf” nature of factory wheels also makes the purchasing process considerably quicker. When you buy a set of factory wheels, you can usually take them home with you the same day, or have them delivered immediately. Custom wheels, on the other hand, might require several weeks to be built. There is a huge selection of cycle wheels available, with many different combinations of size, construction method and material. Knowing what to look for in a wheel can make all the difference to your purchase, especially if you’re a relatively inexperienced cyclist. One of the first factors to consider is size. Most bike frames will require a set size of tyre, so it’s important to ensure that you buy the correct wheel diameter for your bike. Consult your bicycle manufacturer’s website or your bike’s manual if you are unsure what wheel size to go for. Try to find out whether the wheel you are looking at has a rider weight rating. Weight ratings specify the maximum rider weight that the wheel is designed for, with higher-rated wheels usually made of a slightly thicker construction. It is best not to buy a wheel that is under-rated for your weight, as the wheel may buckle or otherwise under-perform when you are out on the road. You should also consider the conditions you will be riding under. For example, it is possible to buy specialist hill climbing wheels, which are built with a lightweight construction. The low mass of these wheels makes them ideal for uphill sections, as they reduce the overall weight of your bike. However, they do not usually give the smooth and comfortable ride of regular all round road wheels. If you intend to take part in bike races, you should probably look for a stiffer rim. 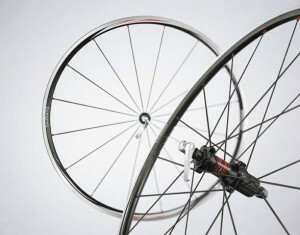 Stiffer wheel rims mean that the bike’s wheel changes shape less during movement. As such, more of your pedalling power can be transferred through your wheels to the road, resulting in a more efficient performance. However, stiff rims have little “give” in them, and are unsuitable for riding on all but the flattest of surfaces. Most stiff rims are made from aluminium, although some high end examples are constructed from carbon fibre. Hopefully the above tips have helped ensure that you pick the right wheel type, whether you opt for factory or custom-built. 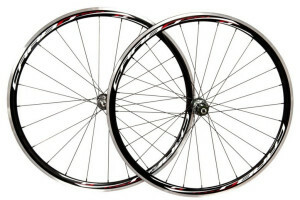 Find out more about bicycle wheels, and purchase your very own set, at the Merlin Cycles store. Tagged buyers guide, campagnolo, fulcrum, mavic, Shimano, Wheels, wheelsets. Bookmark the permalink.